WILLIAMSBURG — Chris Lates admitted to feeling slightly ashamed as he walked toward Williamsburg's first Starbucks, which opened Monday. "I can't believe I'm going into a corporate location," he said. Lates, 30, lives at Grand Street and Union Avenue, just blocks away from the new outpost located under a luxury condo building at 405-409 Union Ave. Some have called Starbucks another shot to a neighborhood that became popular for homegrown businesses, and Lates, 30, didn't disagree. But he is also a Starbucks "Gold" member who frequents Manhattan locations near work and likes the Venti-sizes for iced Americanos, which are larger than the offerings at other places. "I feel weird about it," he said. "But not too bad from going in." In the course of an hour before lunch, more than a dozen people stopped by or sat in the shop, working on laptops or chatting with friends. The cafe takes up most of a corner at Union Avenue and Ainslie Street, and tall windows take up two walls of the modern, angular space. Inside, it is like many other larger, sit-down Starbucks, with a long bar, lots of tables and baristas wearing forest green shirts. Employees couldn't talk — some had just started working for the company as early as two weeks ago. "We're proud to be part of the Williamsburg neighborhood," a Starbucks corporate spokeswoman said. "We are offering a Reserve line of coffees, which are limited availability small-batch coffees. That's a unique aspect of this store." As of last quarter, there are more than 20,500 Starbucks stores worldwide. According to the spokeswoman, more than 700 stores offer the Reserve line of coffees. Not everyone felt conflicted about the chain's opening. Stephanie Valerio said she was happy about the Starbucks as she walked toward the train with her iced soy chai tea latte. It's right near her house, she's familiar with the menu and it's easy for her to pay for her drinks with the Starbucks app, she said. Ray Steffen, 38, who often works from home and from other coffee shops in the area, said he likes the flavor of Starbucks espresso. His girlfriend and some of his friends give him a hard time about liking "burnt, overpriced corporate coffee," Steffen said, but he's "addicted" to the flavor of the ubiquitous chain's brew. "I like the burnt flavor," Steffen said. "I spend half my income on it." Despite the new competition, baristas at nearby coffee shop The West were all smiles Monday. Business was "overwhelming" and "unprecedented," making the day feel more like a weekend than a weekday, said Sarah Madges, 24, the manager of the 4-year-old coffee shop and bar located just a block away from the new Starbucks. Most people who came in Monday morning made comments about the Starbucks opening, joking "as if we'd go there," Madges said, adding she wasn't sure if the surge was related to the chain's opening. Most of the Starbucks customers who spoke to DNAinfo New York said they still frequent The West, citing its homey nature, patio and food. Steffen also noted several other, less-corporate places he frequents, including Gimme Coffee and Blind Barber. 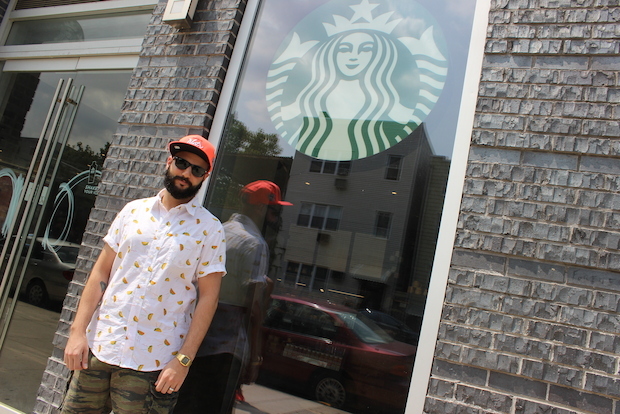 But Michael Scaringella, 32, who's lived in Williamsburg his whole life, said Starbucks opening isn't that different from when The West opened four years ago. "You appreciate the people who make changes," he said. "I enjoy it. That's what's life is about."